Check-out time is 12.00. The rates include VAT. Extra bed — 50% of the cost of one bed in the room. This cozy room is for accommodation of one person. It is an ideal option for tourists travelling alone and those who prefer peace and quiet. 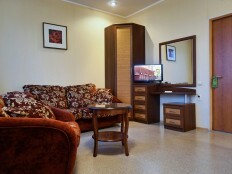 This standard double room is designed for comfortable accommodation of 1-2 people. Standard rooms have two single beds. These bright and spacious rooms are large in area. 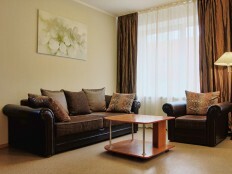 A Comfort room has a comfortable sofa or armchair which can serve as an extra bed. 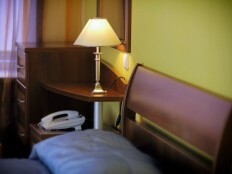 This category of rooms is ideal for business travelers and for tourists traveling with families. The room can accommodate three or even four people! This spacious double room with a single bed is perfect for long stays. Rooms of this category are spacious enough. They have all the conditions necessary for a good rest and effective work. This spacious room is perfect for families with children or for those looking for extra comfort. This spacious 2-bedroom suite is divided into a living room and a bedroom with a large double bed. A great option for newlyweds and those who value comfort!